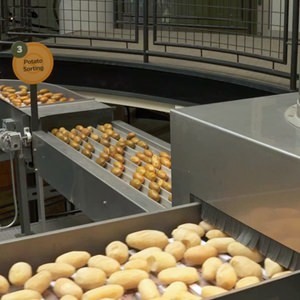 Eastern Oregon’s Morrow County has been called “The Breadbasket of the State” for the abundant variety of food that is grown here and then processed and shipped around the world. 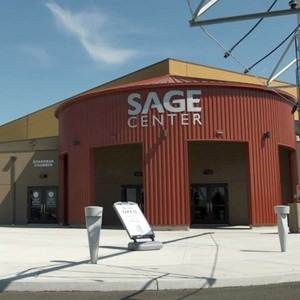 In the wide open country near Boardman, a new silo-framed show-stopper catches your eye and invites you inside the SAGE Center, one of the most intriguing and impressive storytelling sites in Oregon. Your first adventure is a doozy as you are welcomed aboard the only indoor hot air balloon ride in the state. It offers a bird’s-eye view of the many faces of Morrow County’s recreation and more. 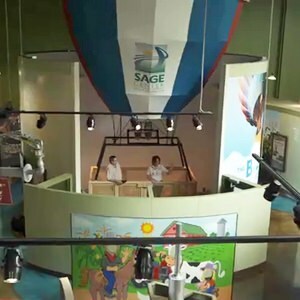 The hot air balloon ride is one of many interactive displays that set the SAGE Center apart from other museums. On the main level, follow the salmon that have been painted onto an ocean-blue trail, leading you to discover the many stories behind Eastern Oregon’s agriculture. You can learn to drive a tractor or turn an irrigation wheel and watch the desert transform into a Garden of Eden with Oregon fruits and vegetables. Gispert knows all about the reach of Oregon potatoes. He is the operations manager for Calbee North America, a food production company and one of 40 major food companies now operating at the Port of Morrow near Boardman. Gispert points to the museum’s centerpiece exhibit: how a potato becomes a french fry, a remarkable visual process that shows off each step that makes a spud into a fry. 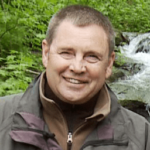 Gispert adds that visitors will learn how his company arrived in Boardman in 2007 to take advantage of easy transportation, cheap hydroelectricity rates and abundant crops that are grown just 17 miles away. He’s right! A nearby world map displays Morrow County’s wide reach to scores of countries that depend upon Oregon’s homegrown food products.